The standardised template that all commercial banks in Malaysia have been made to adopt for housing loan agreements will make it easier for customers to understand contract terms and shop around for loans, says the banking association. Chuah Mei Lin, executive director of the Association of Banks in Malaysia (ABM), said Malaysia is probably the first in the world to have standardised banking loan documentation for the benefit of consumers. Such a move is not construed as anti-competitive practice, she added. Bank Negara Malaysia (BNM) late last month announced that all commercial banks would have to adopt a standardised template for the description of key terms and conditions for housing loans or home financing agreements from January 1 this year. The template only applies to loans for individuals with a principal amount of RM500,000 and below. Chuah explained that this will cover the bulk of housing loans out there as a survey done last year for 2011 showed that 80 per cent of ABM banks' straightforward housing/mortgage portfolio were RM500,000 and below. The template was developed by ABM in consultation with BNM. "With standardisation, key terms are presented in a manner which is consistent, clear and easy to understand. We're seeking to de-mystify terminology," she said, adding that it will also help consumers make a more direct comparison of the financial products and services offered out there. The standardisation will take the form of a three-part agreement - Parts A, B and C - with only Part A containing the standardised terms. Part A will cover key aspects such as payment and calculation of interest, repayment and pre-payment, conditions precedent, and events and consequences of default. The ABM's 13 bank members, which include foreign ones like HSBC Bank and OCBC Bank, have already adopted the template, while the remaining five banks in the country that offer housing loans - Bangkok Bank, Bank of China, ICBC Bank, Bank of Tokyo Mitsubishi and Bank of Nova Scotia - are expected to do by the first quarter of this year. According to Chuah, banks are free to adopt the template for other types of loans, or for housing loans of above RM500,000, if they wish. "Customers just need to ask their bank if they will do it," she remarked. The template does not apply to Islamic banks. 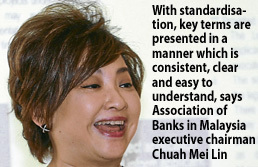 The introduction of the template won't necessarily cut the process time for loans, Chuah said, adding however that the ABM will undertake a survey next year to see if the turnaround time has actually improved. As it stands now, for a straighforward housing loan, banks generally take a minimum of 45 days from the time a customer submits documents to the loan being disbursed. "This is the existing timeline, but some banks are more efficient than this," she noted.